Jumeirah Dhevanafushi, situated in an idyllic and secluded location at the southernmost tip of the Maldives, invites guests to explore the resort’s incredible house reef with the newly unveiled ‘Underwater Snorkeling Adventure’ experience. Guests will begin the morning with an exclusive opportunity to meet with the hotel’s marine biologist, who will talk about the importance of ecology and preserving the reef through an animated presentation. From there, guests will follow one of the resort’s experienced guides and plunge into the warm crystal clear waters, discovering a kaleidoscopic world teeming with marine life. The underwater snorkeling adventure offers the opportunity to listen to the parrotfish feeding off the coral, watch schools of vibrantly coloured reef fish swim by and search for sleeping octopuses by the rocks. Other finds may include trumpet fish, groupers, butterfly fish and wrasse and, if lucky, the guide may be able to find some turtles; further afield dolphins have been known to visit. Competent swimmers can even snorkel along the 850 metre stretch to the water bungalows, swimming along the house reef and diving past the drop-off into the deep blue ocean to discover some of the most incredible coral reefs the world has to offer. The package also offers the opportunity to help with cleaning the house reef, and for anyone looking to go scuba diving during their stay, the resort’s PADI certified Meradhoo dive centre can accommodate beginners right the way through to experts. The resort comprises 37 suites, including 21 villas on land and 16 over water Ocean Revives and Sanctuaries that are only accessible by boat. 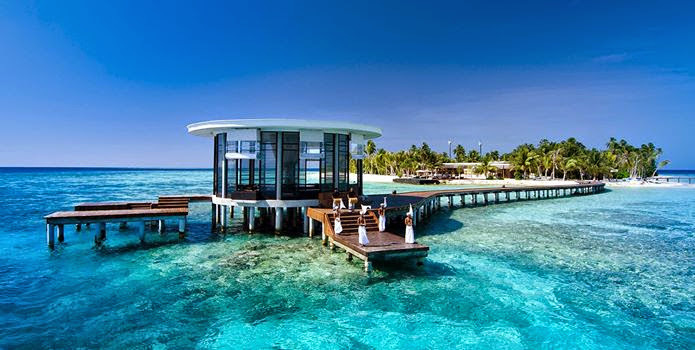 The over water villas are even equipped with a small ladder from the decking which leads directly into the azure waters of the ocean, perfect for more snorkelling. All accommodation options offer a private pool and personal butler. Three restaurants and one cocktail bar offer mouth-watering delicacies and those looking for adventure may enjoy motorised or non-motorised water sports. Special excursions for couples can also be arranged including a romantic dinner cooked by a chef on the nearby private island Minimenza.